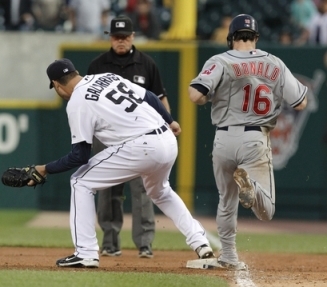 June 2, 2010 will go down as a momentous day in baseball history. Future Hall of Famer Ken Griffey Jr. announced his retirement and first base umpire Jim Joyce blew a call on what should have been baseball’s third perfect game this season. Both events will be remembered for some time to come. Tonight’s Yankee game, however, will not. The Yankees victory over the Orioles was overshadowed by an eventful day in baseball that included this blown call at the end of a would-be perfect game. Although baseball is by far one of the most unpredictable sports, some games just scream mismatch. Brad Bergesen versus Phil Hughes was one example. After a scoreless first inning, the Yankees essentially put the game away with a four run second inning. The offense, which featured three hit nights by Nick Swisher, Robinson Cano and Curtis Granderson, would go on to pile up nine runs, but the rest of the game was all about Phil Hughes plowing through the Orioles lineup. Over seven innings, Hughes only went to one three-ball count, while throwing 72 of his 102 pitches for strikes. His only hiccup occurred in the sixth inning, when Ty Wiggington singled home Miguel Tejada, who had doubled earlier in the inning. In addition to improving his record to 7-1, Hughes also surrendered two runs or fewer for the eighth time in his 10 starts and moved up to third in the American League with a 2.54 ERA. Aside from Hughes continued emergence as an ace starter, the biggest story for the Yankees was the return of Jorge Posada to the lineup as a DH. Before the game, Posada acknowledged that he would likely be occupying the DH role with increasing frequency, a concession that Posada hitherto had been unwilling to make. Although Posada will still see his fair share of games behind the plate, a more permanent transition to DH will not only help ensure that he stays healthy, but also allow the Yankees to benefit for Cervelli’s superior defense. In addition to Posada’s return, the continued hot hitting of Curtis Granderson also bodes well for the Yankees. With his three hits tonight (his only out was the result of an outstanding running grab by Adam Jones in deep right center), Granderson is now hitting .400/.434/.700 in 23 plate appearances since returning from a groin injury. With everything falling into place, the Yankees could be primed to take advantage of a favorable June schedule. For that to happen, games like this need to become more routine. If the Yankees can have enough forgettable wins, they’ll be on their way to another memorable October.